This article is about my streamlined workflow when dragging&dropping midi-files/-clips inside Ableton Live into Spectrasonics Instruments. So, if you’re not using Ableton Live this will not be interesting for you. If you’re not using Spectrasonic Instruments it may be interesting, though because you may use other tools with offer midi droppging functionality. In this case I recommend to read on and decide by yourself. Why is using midi-clips/-files that important? We’re living in the 21st century now and midi is like from the ancient times, right? Midi is awesome to generate new ideas by combining – not so obvious – sources (like conga grooves used with electric bass sounds). Midi is a standard used by many tools, so I’m very happy, that it’s still alive and supported by many different vendors. This particular topic started for me as I was watching some videos about Spectrasonics’ awesome feature of Groove Lock. To make this short, this feature allows you to lock rhythmic material like drum loops from Stylus RMX to other rhythmic material like a arpeggiator baseline from Trillian. 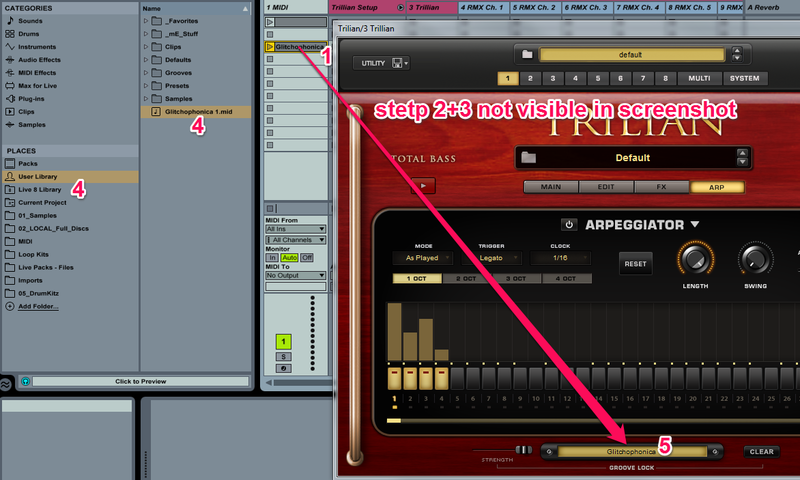 To make this even better it allows to lock to any specific rhythm as long it is stored in a midi file. In the Spectrasonics video the workflow to do this looks very smooth because both tools offer dragging AND dropping of midi files as a function. Therefor this looks like a breeze to work with. It aint working directly. <BZZZZ> Thank you for playing . In the case of Trillian the plugin is crashing when you do this and not only Trillian alone is crushing but it will take Live down as well into the digital abyss of restarting and starting anew. After a short exchange with Support at Spectrasonics (quick answer btw, thanks a lot for that!) I got the information that only plain midi files are allowed to use this function and to prevent the crash. You may not spot the difference between “Midi file” vs. “Midi Clip”, but there is one, proved as above. Yes, there is the “Export Midi-Clip”-function in Live, available via context menu / right-click on the midi clip. You may even use the Strg-Shift-E key combination to speed up the export. The good news: Midi files exported using this function will work in Trillian/RMX as wanted. But oh shame, they’re located in the filesystem and not available for instant dropping. I found exporting them to the windows file-system, locating the directory, minimizing ableton, dragging the Midi file from Windows Explorer to Ableton/Trillian too awkard for my taste. Now, Ableton forum / TYLRbass to the rescue: Discussing the problem there brought the idea, to export not to an arbitary Windows directory, but directly to the user library of Ableton directory (check Preference – Library – Locatin of User Library if you’re not sure about the location on your machine). With this small change, the created Midi file is directly visible and available for dragging inside of Live. I don’t have to switch to windows explorer or other tools. Maybe the conversion from Midi clip to Midi file will be included in future version of Live, but right now I’m happy with this procedure. Hope you find it useful as I do.